Are you in good voice? When I think about the trends that are facing marketers and business owners in 2019, the one that I believe is going to be most significant is the influence of voice on search and content. Not only do I think it’s critical, but I think it is growing faster and stronger than anyone could have imagined. Let’s define the term, so we’re all on the same wavelength. 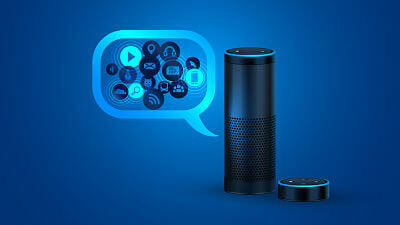 When we talk about voice what we mean is all voice-activated or operated devices, apps, and the Internet of Things accessories that you may have in your home, vehicle or office. What’s so fascinating about this trend is that even though it’s just beginning to truly emerge, it’s already so woven into our daily habits that we’re taking it for granted. Think about how often you give voice commands. While you’re making breakfast are you asking Alexa to play your favorite podcast? Are you telling Nest to lower the temperature in the basement or asking Siri to give you an update on how the Cubs did last night? These devices aren’t just in our homes. How often do you talk to your car, asking it to call someone or give you a traffic update? According to comScore.com, the number of U.S. households with smart speakers grew by 49 percent from June to November 2017. Today, smart speakers are predominately the Amazon Echo, Google Home, Apple HomePod, and a few other emerging brands. Because they were the first to launch, Amazon Echo dominated and had 88% of the market share in 2016, but Google Home is gaining ground quickly since its introduction in October of 2017. It’s already trimmed Amazon’s control of the market to 52%. Controlling our home, car or office is interesting but how does all of this technology intersect with marketing? The most obvious place is search. According to Branded3 and data collected from IBM, 25 percent of searches on Windows 10 taskbar are by voice. A report from Search Engine People cited that 20 percent of mobile searches on Google are made via voice command now. 55 percent of teens and 41 percent of adults already execute voice searches multiple times per day, and the forecast is that by 2020, 50 percent of all searches will be via voice. This is where Google can quickly become the defacto market leader. When you ask Alexa to search for something online, she is only able to search the topic using Wikipedia, which is not as comprehensive as using Google, which comes native as part of Google Home. This provides Google with a huge advantage to penetrate more and more areas of our home. A recent Google survey estimated that 72 percent of people who own a voice-activated speaker say that their devices are often used as part of their daily routine. And it’s just an emerging trend. So from a practical point of view, what does this mean for us as marketers? Let me answer that by leaving you with this question. Today we fight for a page one ranking in Google because we know the user will review a few of the listings before they click on one. But with voice, you ask a question, and the device serves up a single answer. How might that change our strategies around PPC, search and organic SEO? How do you become the one answer? And that new wrinkle is just the tip of the iceberg. As this technology weaves itself into our culture, it’s going to have lasting impact on how we go through our daily lives and how, as marketers, we intersect with people in new ways.